QHow do you look at the current Constitution-making process? Mainly, there is no clear mandate either to bring about a new Constitution or to amend the existing one. In the run-up to parliamentary elections, the Sri Lanka Freedom Party (SLFP) spoke of amendments to the present Constitution and the United National Party (UNP) about replacing it with a completely new one. No party received a mandate to form its own government. Now, the two main political parties have joined for governance. We inquired about the Constitution-making process from Prime Minister Ranil Wickremesinghe and MP Jayampathi Wickramaratne who play pivotal roles in this endeavour. During the discussion, our Mahanayake Theras inquired about the flawed areas of the present Constitution (if there were any), and how they were to be rectified. However, we did not get a clear-cut response in this respect. Nevertheless, it is obvious that the government is heading for devolution of power based on the 13th Amendment to the Constitution. We always insist that a strong central government remains in the country. We participated in the discussion based on this position we cherish. Our territorial integrity should be inalienable. QThere is a lot of talk about the status to be accorded to Buddhism as the majority religion. How do you look at this? We have taken the position that the provisions of the present Constitution be further strengthened in regards to this matter. We have drafted a bill to protect and foster the Buddha Sasana, but it could not be enacted. The bill, if enacted, will strengthen the provisions of the present Constitution related to Buddhism. The hierarchy of the present government constantly asserts that the current constitutional provisions related to Buddhism will not be altered or compromised. However, we feel that there are moves to incorporate fresh provisions garbed under different concepts to negate the relevance of the existing provisions related to Buddhism. In the sub-committee reports, propagation of religions has been recommended as a fundamental right of any person. We always believe in religious freedom for all. We have upheld that position. But, we cannot approve of such a right (propagation) for any person as it could be detrimental to the established religion of our country. We also have a few court rulings on this. The court has ruled on this considering the provisions in the Indian Constitution and some other judicial interpretations in Europe. Accordingly, there are recommendations in sub-committee reports that pose a threat to Buddhism. On the one hand, the Constitution-making process is underway while on the other, we see Cabinet papers seeking the enactment of bills to recognising homosexuality or people with different sexual orientations. Alongside, we have observed several other attempts to diminish the significance and hold of the Buddhist culture of this county. In texts prescribed for school curricula, the stories woven around our noble heroes of history have been omitted in the name of reconciliation. QWhat are the other attempts you witnessed so far? In the recent past, the stories and events related to King Dutugemunu, Ven. Tibet S. Mahinda Thera, great poet Mahagamasekara and statesman Anagarika Dharmapala have been discarded. We learn of attempts to exclude texts related to Thupawamsa from the Advanced Level Sinhala syllabus. In a Sinhala literature textbook, a lesson on the customs and rituals of Muslims has been included. We all value reconciliation. We live amicably with all religious and ethnic groups. Yet, these are disturbing moves for reconciliation in real sense. The inclusion of a mere constitutional provision to safeguard Buddhism will not serve the intended purpose unless these activities are stopped. QHow do you advocate the strengthening of current constitutional provisions? We worked out a bill which sought to give impetus to the existing provisions in fostering and nurturing the Buddha Sasana. Although it was done five years ago, it had not been enacted yet. It was drafted by leading monks together with the assistance of legal luminaries including Manohara de Silva. It does not pose any threat to any religion. It was done in accordance with the recommendations by the Commission on Buddha Sasana. A definition has been given for Buddha Sasana in it. QThere is an argument that it is discriminatory of other religions to afford foremost status to Buddhism. How do you respond? It is not so. We have not acted in a manner that harms the interests of other religions. The rights of other religions are guaranteed under Article 14 of the Constitution, and we recognise them. However, we have to bear one thing in mind. In almost all other countries, their respective religions have been assigned special positions. In Norway, majority Cabinet slots are constitutionally assigned for the followers of the Lutheran Church. As for the Malaysian Constitution, religious freedom is guaranteed for all, but Islam is given the pride of place with special safeguards. In England, royalty is always linked with the Church of England by convention. In the United States, even in currency notes, religious affiliation is mentioned. That is the world situation. Sri Lanka is and will be a country that protects Theravada Buddhism. We work for constitutional provisions to enable this task in the greater interest of generations to come. As Buddhists, we do not harm anyone. However, Sinhala Buddhists stood up whenever they felt threatened in their own land. Buddhist monks led such mass risings. We identify a danger lying with the devolution of land powers to the provinces. Already, ancient Buddhist archaeological and historical sites are encroached in the Northern and Eastern provinces. The governing bodies in those territories try to work out legal means to obliterate any trace of Buddhist identity in their area. We hear some voices averse to Buddhism being given the foremost place. That is politically motivated. Otherwise, all other religious groups of this country live in harmony with the Buddhist culture. Be it from Catholics to Hindus, no such outcry is made against Buddhism. We met with Malcolm Cardinal Ranjith even in recent times. He said his religious community was also able to live amicably with others in this country because of the Buddhist cultural ethos in social order. Thus, he does not mind Buddhism being given the foremost status. 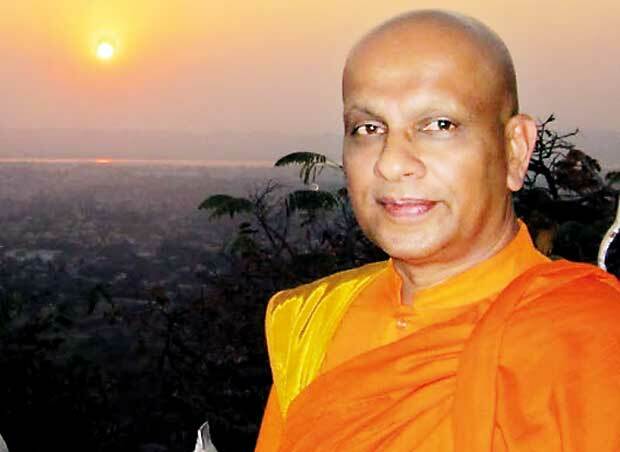 QSome politicians say Bhikkhus should confine themselves to their religious duties. What are your thoughts? Buddhist monks stay away from their family links. We become common personage to all. We go by the names of our villages and not by surnames. Unlike politicians, we live off alms offered by ordinary people. Politicians do a contractual job for a term of five years or so. Most politicians work for their personal comforts in life, sometimes losing their perks and posts after a term. For us, it is not so. A duty is naturally cast upon us to be carried right throughout our lives for the good of the society. As a result, we are dedicated for it. We are observant of the process of making the new Constitution as it is the supreme law of the country. It has to be done for the common good of our people. Before enactment, it should be shown to the Mahanayake Theras and Maha Sanga for their concurrence. We will object it if unacceptable. In 1994, there were proposals brought in the guise of upholding human rights. One such proposal was meant to ensure any person, even from outside the country, to engage in religious propagation here. It had been garbed under human rights. That was something that could harm the majority religion. In 2000, a political package was introduced. There again, the Maha Sangha protested the precarious position into which Buddhism was placed in. The Mahanayake Theras resolved and informed the government at the time that Buddhism enjoyed its rightful foremost position historically; since its founding in this nation by the arrival of Arahat Mahinda. Even the English rulers did not act to strip that right as a whole despite creating certain odds. The then Mahanayake of the Asgiriya Chapter Most Ven. Palipane Sri Chandananda Thera informed the government that the foremost position for Buddhism was something due by historical convention. Otherwise, it is not something to be accorded to it by someone. He asked the government to recognise it constitutionally. The then leaders responded to it saying no compromise would be made in this respect. Our Mahanayake Thera was not pleased with such rhetoric alone. He insisted on the recognition of this as a fact in the Constitution – the foremost place historically bestowed upon, not accorded by someone. Building further on this, we have now decided to submit proposals to the present government for consideration. In previous proposals for Constitution-making, Buddhism had been referred to as Buddha Dhamma. When you say Buddhism, it involves something more than Buddha Dhamma which is basically the doctrine in Tri-pitaka. In addition to Tri-pitaka, Buddhism involves cultural features like Vihares, Chaithyas, literature and customs. We dealt with this broad concept in the bill we drafted. A certain religious organisation protested against that bill at that time. Ultimately, it could not be enacted. QThere is a school of thought that Bhikkhus should not do politics. What is your opinion? That is again dependent on how you define politics. Minister Wijeyadasa Rajapakshe also brought in a piece of legislation. It has been identified in the draft bill that a Bhikkhu should not take to politics as an MP. Yet again it depends on the atmosphere of the Parliament. Currently, it has been relegated to a place providing jokes for people. In general terms, village development councils, for example, are meant for development activities at a rural level, and the Parliament is a forum where the entire country is represented to decide on its development. As things stand at the moment and going by the conduct of members, Parliament is not suited for Bhikkhus. We have to decide accordingly. It is a relative situation. Yet, every activity in life is associated with politics. Bhikkhus are dedicated to serve people. So, there is no harm in their involvement in politics in the greater interests of people.